Light pink and light purple colors are coming your way. Need a sweet little bow, this is it. The bottom is a 1.5" pink grosgrain ribbon, with a satin 7/8" purple with matching pink swirls and suns on it. The middle is wrapped with a pink, purple, and lime green mix of polka dots and flowers. 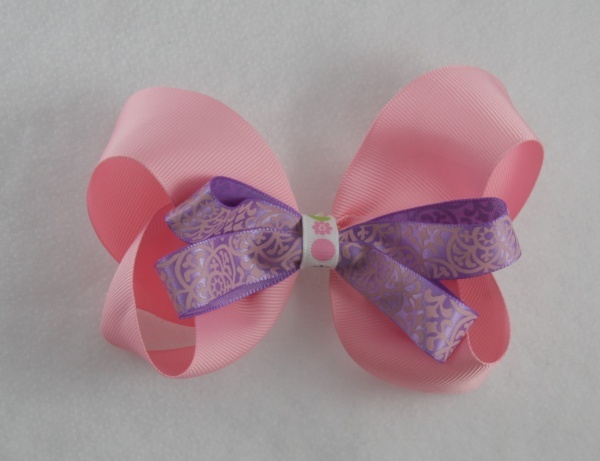 This bow was designed by Lena Bean for Lexa Lou collection.